Wondering where to eat in Seattle? 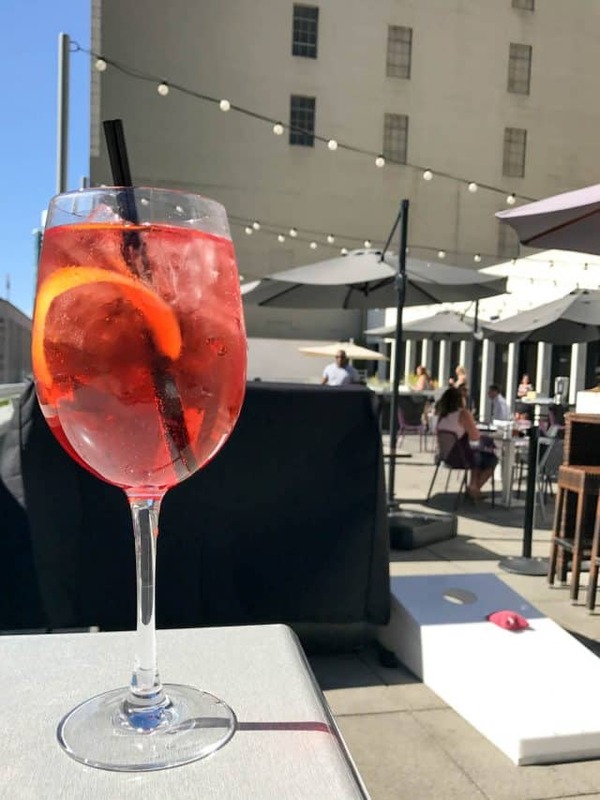 Look no further, I have a fantastic recommendation for you: Frolik Kitchen + Cocktails atop the Motif Seattle hotel. An indoor/outdoor restaurant and cocktail lounge, it’s the perfect place to grab a quick breakfast, relaxing lunch, or a fun dinner. Last month, when we were in Seattle, we ate TONS of food. My favorite thing to do when I travel to a city is not see the sights or do a museum; no, my favorite thing to do is EAT. Before I travel I spend weeks researching the best restaurants for every meal (and snacks in between). Which has the best dessert menu? What bakery should we try for breakfast? 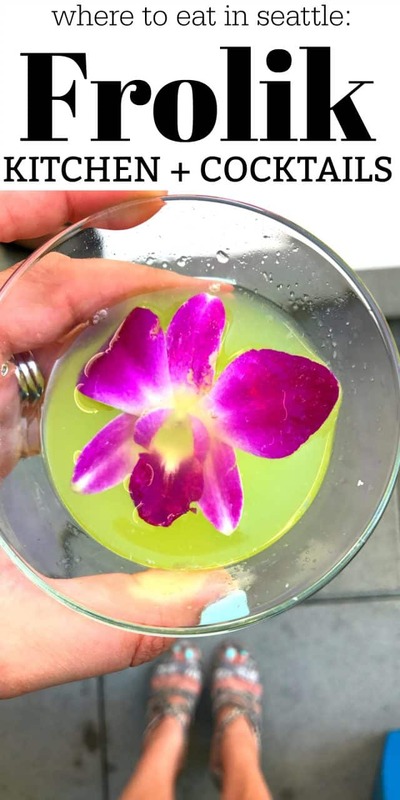 What bar has the best cocktail menu? I travel armed with a list and a personalized google map and my stretchy pants. When we arrived in Seattle for our stay at Motif, I knew we’d be eating at one of the better restaurants in town because it was inside the hotel. We’d be enjoying dinner there our first night, as well as cocktails and breakfast during our stay because when your hotel has a gorgeous rooftop bar you take advantage of it – daily. 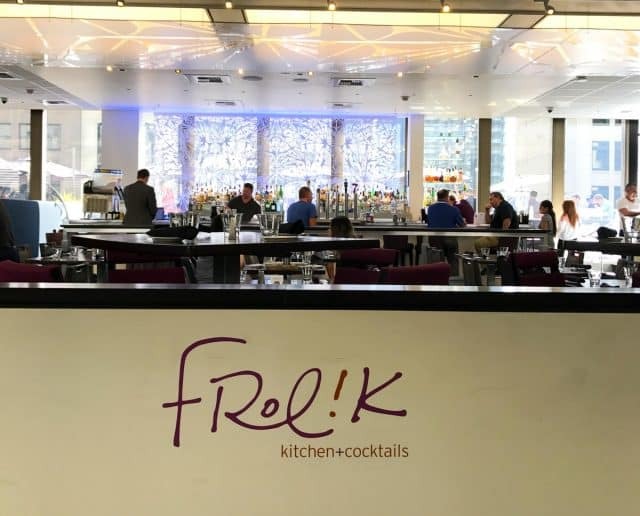 Frolik Kitchen + Cocktails is the destination spot for downtown Seattle, complete with regional American cuisine and a rooftop bar. Also: their drink menu is en pointe. The drink menu consisted of fun drinks like an Italian Afternoon (above) or a Summer Sour (top photo). Both had liberal pours and tasted fantastic. This is also the place I fell in love with rosé. Jordan was with us on our trip and her favorite “bar” drink is a Shirley Temple. Unfortunately, they didn’t have grenadine or cherries but the bartender offered to make a hibiscus syrup version. Jordan was thrilled and drank several of them, proclaiming them even better than her regular Shirley. She also discovered a virgin mojito and has since begged me to make them at home. 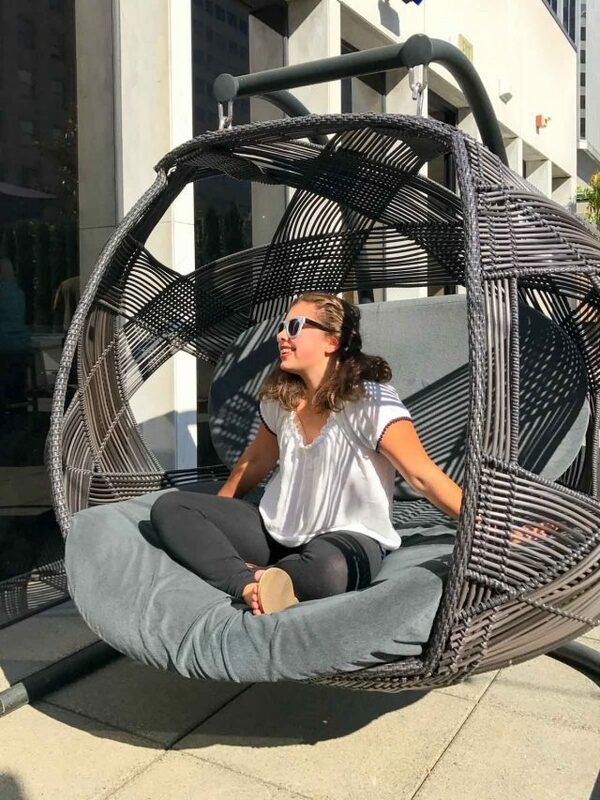 Did I mention the comfortable chairs on the rooftop? Jordan is a budding YouTube and Instagram star, so we took several shots to get the perfect “look,” which she immediately filtered Reyes (her signature filter). 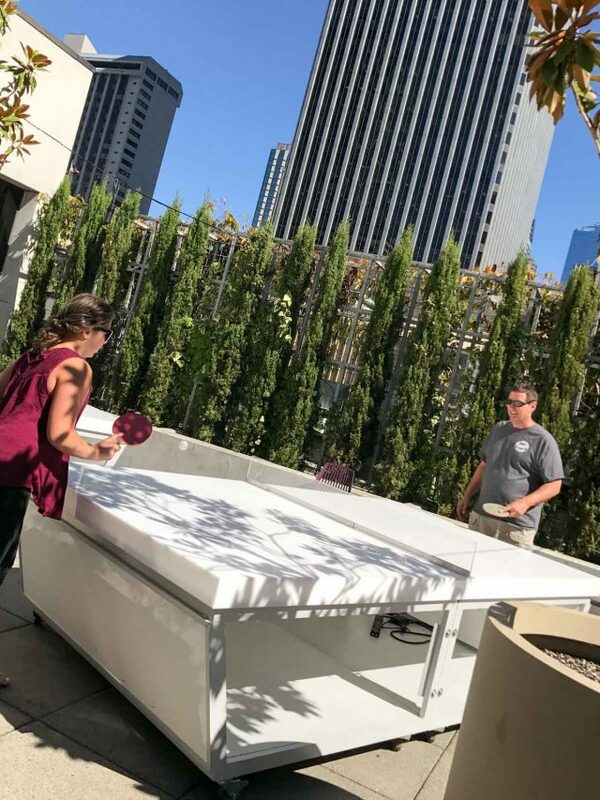 The rooftop bar also houses pingpong and corn hole. Mel and Jordan enjoyed hitting other patrons with their ping pong balls. ? At night, the two games light up neon and change colors. It was fun to watch from our hotel room, which overlooked the bar several stories above. Jordan has a good arm, it turns out! Of course, hanging out at the bar wasn’t the only thing we did at Frolik…we also ATE! The menu is wide ranging, since they serve every meal. We ate breakfast there one of the mornings. I absolutely LOVED the granola. It was beyond delicious, and the coffee was GOOD, not the normal “hotel coffee”. On our first night, Frolik hosted us for dinner. We ordered off the bar and dinner menu (and dessert) for a nice variety. For appetizers we ordered the Cured Meats, Penn Cove Mussels (which Jordan liked!) and House Roasted Rosemary Nuts. 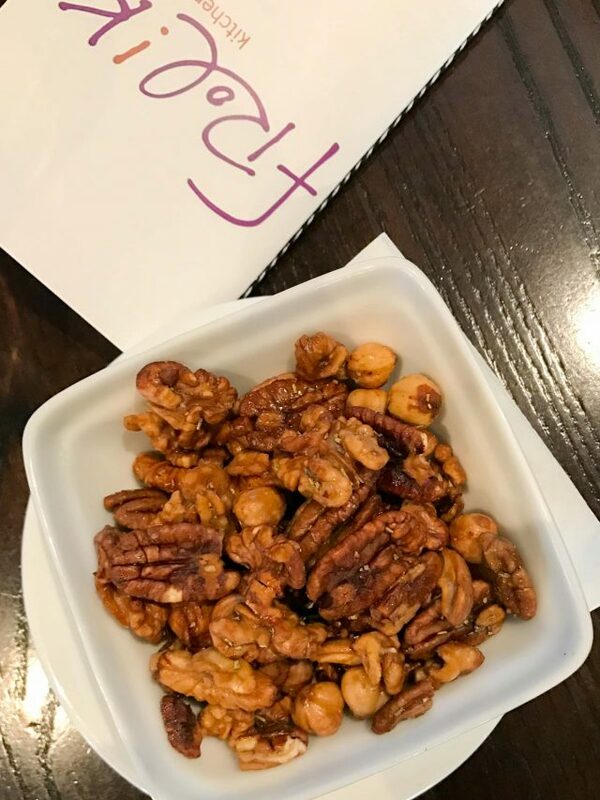 Those nuts were one of the BEST snacks I’d ever tried and cannot wait to try and recreate them at home. Dinner was the Grass Fed Burger (Jordan gave it two thumbs up), the Confit Duck Leg (Mel still talks about it), and I ordered the Skirt Steak Fritz (um, it had bacon on it… #winning). After all that food I wasn’t hungry, but I pressed on. It’s a hard job, but someone has to do it. 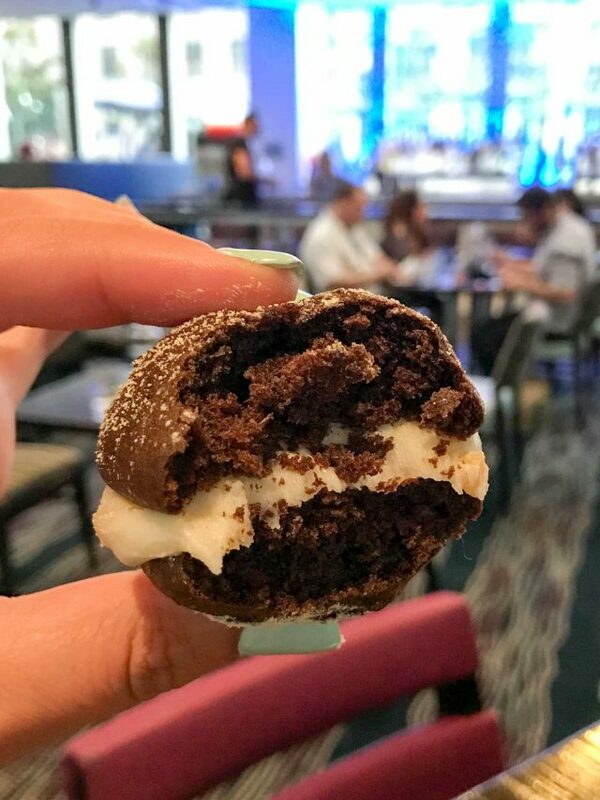 The first thing that caught my eye on the menu was the chocolate whoopee pie, complete with a salted peanut frosting and peanut powder. Mel’s was practically salivating (peanut butter is his favorite thing). BUT…do you want to hear something shocking? Mel said he liked the Almond Poppyseed Cake the best. I know, right? Still a head scratcher. 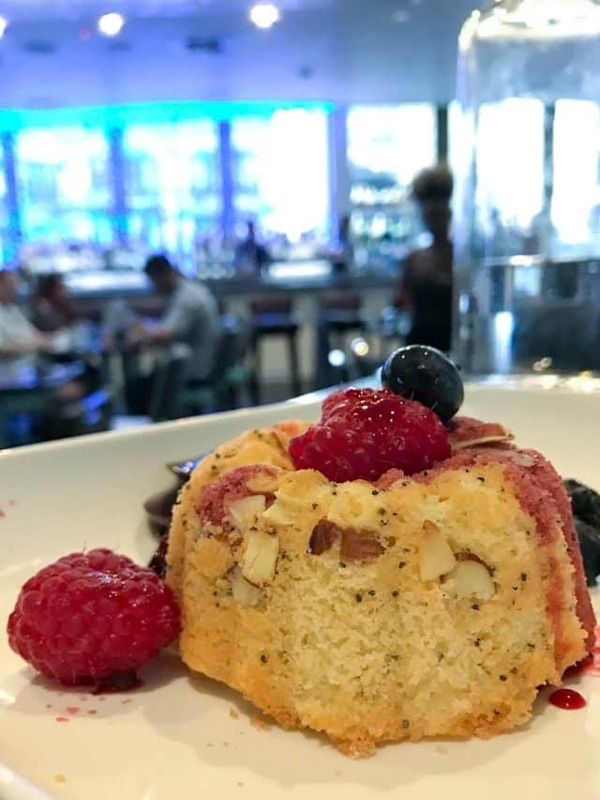 The almond poppyseed cake isn’t something I’d normally order but seeing it on the menu made me crave almond extract (which I’d drink if it wasn’t, you know, gross). This little cake was HEAVEN. Mel ate more than one bite, a record. It was so good I had to try and recreate it at home: Almond Poppyseed Loaf Cake. Just as good…but sadly without the nice atmosphere. Overall, our meals at Frolik Kitchen + Cocktails were fabulous. I loved every bite, plus the staff is friendly and accommodating and happy to be there. I 100% recommend it if you’re in Seattle, either a local or visiting! Now…back to that almond cake. It’s what dreams are made of…. Frolik Kitchen + Cocktails hosted us for dinner during our stay in Seattle. All opinions are 100% my own. The restaurant sounds divine, but no bocce ball? 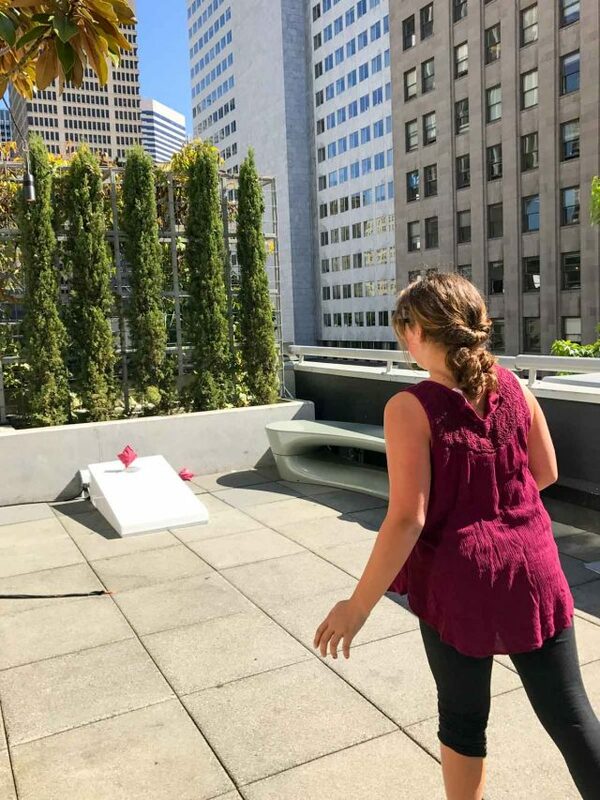 That rooftop looks like such an awesome spot! Tell Jordan I want to play pingpong with her and that I’m jealz of her hibiscus syrup mocktail!